Ghosts of Mississippi is a 1996 American biographical courtroom drama film directed by Rob Reiner and starring Alec Baldwin, Whoopi Goldberg and James Woods. The plot is based on the true story of the 1994 trial of Byron De La Beckwith, the white supremacist accused of the 1963 assassination of civil rights activist Medgar Evers. James Woods was nominated for an Academy Award for Best Supporting Actor for his role of Byron De La Beckwith. The original music score was composed by Marc Shaiman and the cinematography is by John Seale. Medgar Evers was an African-American civil rights activist in Mississippi who was murdered by an assassin on June 12, 1963. It was suspected that Byron De La Beckwith, a white supremacist, was the murderer. He had been tried twice and both trials ended in hung juries. In 1989, Evers' widow Myrlie, who had been trying to bring De La Beckwith to justice for over 25 years, believed she had what it takes to bring him to trial again. Although most of the evidence from the old trial had disappeared, Bobby DeLaughter, an assistant District Attorney, decided to help her despite being warned that it might hurt his political aspirations and despite the strain that it caused in his marriage. DeLaughter becomes primarily involved with bringing De La Beckwith to trial for the third time 30 years later. In 1994, Byron De La Beckwith was found guilty and sentenced to life imprisonment, giving justice to the family of Medgar Evers. The soundtrack of the film, with a score by Marc Shaiman, featured two versions of the Billy Taylor composition "I Wish I Knew How It Would Feel to Be Free" – one sung by Dionne Farris and the other by Nina Simone – as well as numbers by Muddy Waters, Tony Bennett, Robert Johnson and B.B. King. The movie received mixed reviews from critics, with Rotten Tomatoes giving it a 43% rating based on 30 reviews. The film was not a theatrical success, making only half of its budget back. ^ Steve McDonald, "Marc Shaiman: Ghosts of Mississippi", AllMusic Review. 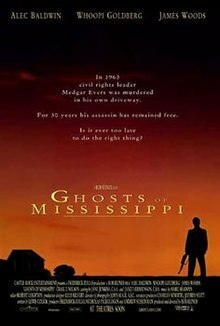 ^ "Ghosts of Mississippi (1996) - Box Office Mojo". www.boxofficemojo.com. Retrieved 2016-11-04.